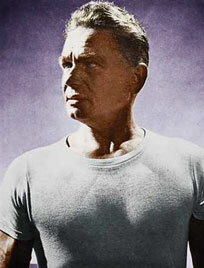 Joseph Pilates was born in Eastern Germany on December 9, 1883, and immigrated to England in 1912, working as a circus performer. In 1914,he was placed in forced internment on the Isle of Man at the outbreak of WWI. While in the internment camp, he began to develop the exercises that evolved into what we now know as the Pilates mat work. Pilates developed his work from a strong personal experience in fitness. Joseph Pilates was trained in gymnastics in school and inspired by the ancient Greek ideal of man perfected in the development of body, mind and spirit. On his way to creating his own method he called “Contrology”, he also studied anatomy and developed himself as a body builder, a wrestler, boxer, skier and diver. Joseph Pilates’ New York studio put him in close proximity to a number of dance studios, which led to his “discovery” by that community in the early 1940’s. Many dancers, performers, politicians, socialites, and just normal people of New York depended on the Pilates method oftraining for the strength and grace it developed in the practitioner, and its rehabilitative as well as preventative qualities. Until exercise science caught up with the Pilates exercise principles in the 1980s and the surge of interest in Pilates that we have today got underway, it was chiefly dancers and elite athletes who kept Joseph Pilates’ work alive. Joseph Pilates called his work, contrology. He defined Contrology as “the comprehensive integration of body mind and spirit.” This philosophy is beautifully elucidated in his book, Return to Life Through Contrology.